Up until recently I didn’t really give much thought about where my beauty ingredients come from - it takes time and a whole lot of googling to decode a product label. It’s a bit of a minefield. But unknowingly to me, three skincare products that I’m currently besotted with, are actually vegan. Meaning these lotions and potions do not contain any animal extracts, or animal by-products. I’m not particularly snobby with my skincare ingredients, if I see results I’m sweet. But it seems upping my ethics and being more conscious of what goes into my skincare products is worth my time and money as these products have been a god send. 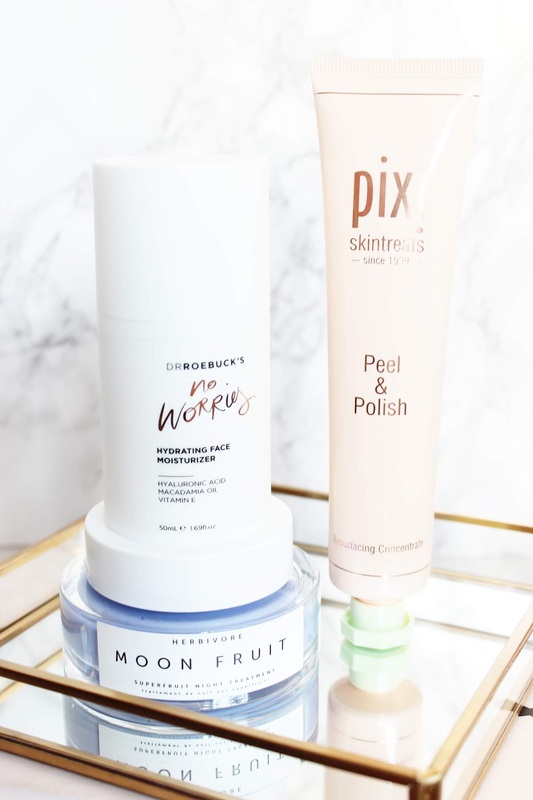 Similar to PIXI Peel and Polish, Herbivore Moon Fruit Superfruit Night Treatment is packed with fruit enzymes to gently resurface the skin and unclog pores. The overnight mask also contains hydrating butters and hyaluronic acid, which gets a thumbs-up from me as it helps to keep my skin plump. And despite its purple appearance, you can wear the mask overnight without creating a mess on your pillowcase as the colour disappears as you massage it in. I’m yet to be completely won over by its lavender-scented formula, but slapped onto the skin in the evening, topped off with a facial oil to boost hydration (as Herbivore suggests), I wake up in the morning looking like I’ve drunk my two litres of water. If you’re dehydrated, sensitive or wanting to ditch dull skin, it’s worth the splurge. I’m fussy when it comes to moisturisers, as I have dehydrated skin, but I hate anything thick or tacky on my face, especially when the weather turns sweat-tastic. But Dr Roebuck's No Worries Hydrating Face Moisturizer has been ticking all the right boxes and has slipped seamlessly into my skincare routine, bumping all other moisturisers to the back of the cabinet. Its lightweight formulation includes a simple blend of effective ingredients such as hyaluronic acid and macadamia nut oil two moisture-magnets and vitamin E for added anti-aging benefits. Gently massaged into my skin it’s easily absorbed and non-greasy, leaving it feeling soft, supple and plump. And it’s inclusion of glycerine (commonly found in primer) helps create the perfect canvas for makeup. The only criticism is it doesn’t contain SPF. But as I’ve been pretty dedicated to my new skincare find I’ve invested in an additional facial SPF. Meet my current skincare favourite; PIXI Peel and Polish. This 2-in-1 mask and polish is a miracle worker. Because with most skincare products you don’t expect to see actual results until you’ve used them consistently for several weeks, but I kid you not, in just 5 minutes this product transforms my skin. The PIXI Peel and Polish contains lactic acid and papaya enzyme, which acts similarly to an AHA (but is far gentler), to remove all the dead skin cells from your face. Twice a week I apply the mask for 5 minutes post-cleansing, then with my fingertips I gently massage it in, then remove with warm water. As its acid based it does cause some tingling, but it’s fleeting and comfortable. The result? Instantly softer, brighter skin, with no tight feeling or drying. In fact, the results aren’t too dissimilar to Peter Thomas Roth's Pumpkin Enzyme Mask, but it’s far cheaper and your skin won’t look red immediately after use. What are your thoughts on vegan beauty products?